These little super easy apple cake bars are very moist, thanks to the oil and the plain Greek yogurt. And they get even more moist after the first day! I like to call these apple squares. This is my second apple recipe in a row! 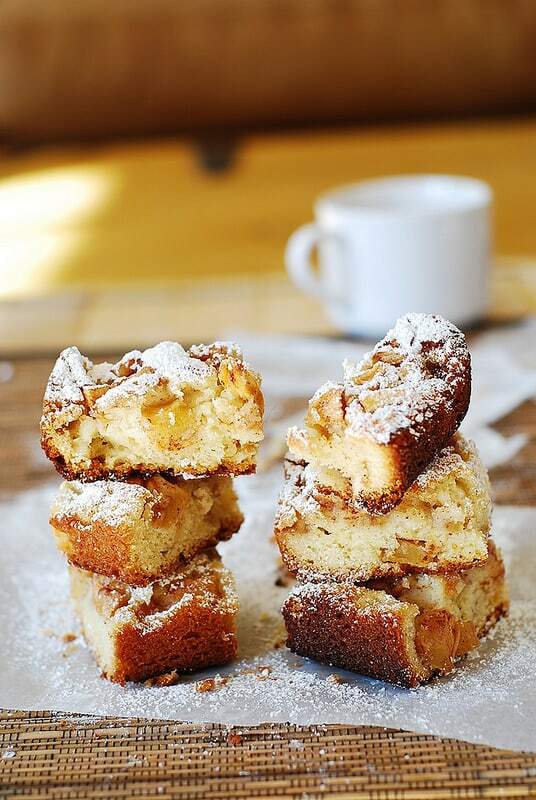 If only I could post apple desserts every day from now on until the Fall is over …. Maybe, someday… For now I have a day job I need to attend to – which sort of prevents me from publishing posts about apples every day. 🙂 What a bummer! 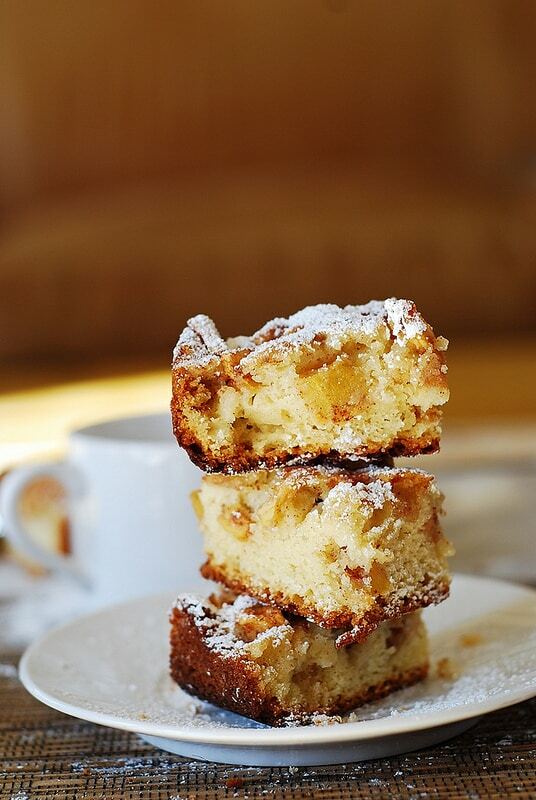 Which is why this apple cake bars recipe is so handy! These apple squares are super easy and quick to prepare on a busy weeknight! If you’re bored with making the same apple crisp (or crumble, or cobbler), try these little squares, and you’d be very happy! 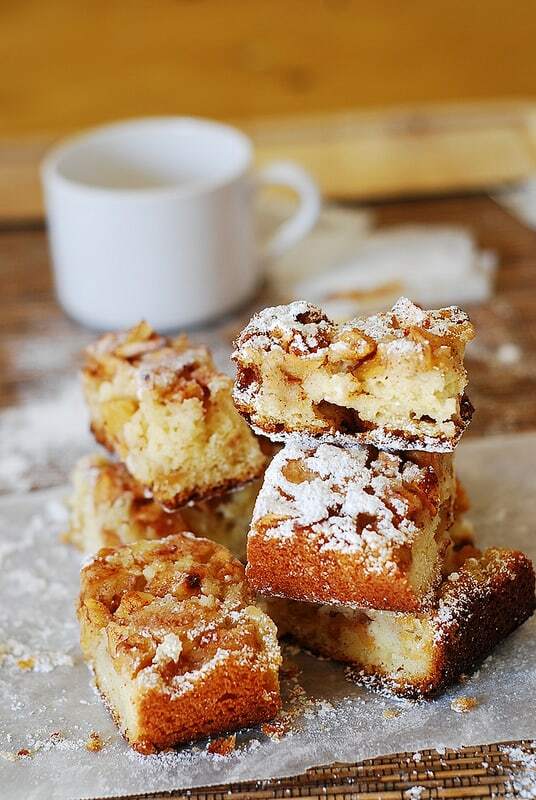 These little cute apple cake bars are very moist, thanks to the oil and the plain Greek yogurt. In this recipe, I am using a generous amount of apples, tossed together with cinnamon and brown sugar, folded in the cake batter and baked in a 9×9 square pan. 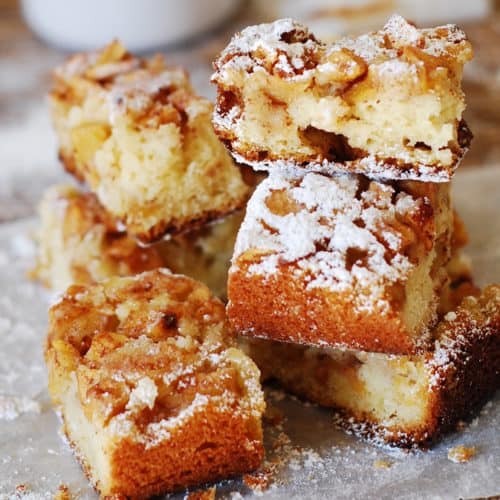 These apple cake bars are really just a lot of apple chunks held together by a relatively small amount of cake batter. 🙂 After all, the apple dessert recipes should be all about apples, shouldn’t they? 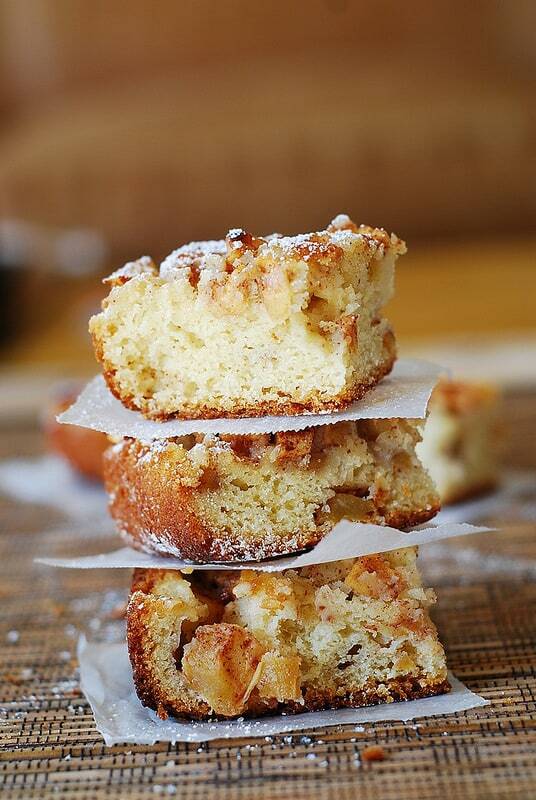 Super moist and easy-to-make apple cake that is then sliced into imperfect squares. These delicious cake bars are very moist, thanks to the oil and the plain Greek yogurt. And they get even more moist after the first day! Preheat oven to 350 degrees. Grease a 9×9 square pan. In a medium bowl, toss chopped apples with cinnamon and brown sugar. In a mixing bowl, combine together 1 and 1/4 cups flour, 1 teaspoon baking powder, and 1/8 teaspoon salt. In a separate bowl, whisk together 1 cup of white sugar, vegetable oil, yogurt, and vanilla until very smooth. Add eggs and whisk until smooth. Add dry ingredients (flour mixture) into wet ingredients and mix until just combined. Pour half of batter into the greased pan, top with half of apples, then pour the remaining half of the batter on top of the apples layer. Top with the remaining half of apples. Bake the cake for about 45 minutes or 1 hour - until a toothpick inserted into the center comes out clean. This looks delicious! Is there anyway to make it dairy free? Like can I remove the yogurt and add more oil? Thanks! Yes, you can remove yogurt and substitute it with the same amount of vegetable oil or olive oil instead. I was looking for a cake recipe with apples since it’s apple season. Your cake looks yummy. What are types of apples that are best to use for this cake? Looking forward to making the recipe. Thanks for sharing it. Excellent cake and easy to make! It only took about 25 – 30 minutes for me. Recipe says to bake for an hour! So glad you enjoyed this recipe! Yes, the baking time might vary depending on the oven. Moist and delicious!! Easy to make,thanks for sharing.